The country has entered a critical phase, as the people wait for the 12-point u nderstanding between the Maoists and political parties to kick in and yield the twin fruits of peace and democracy. 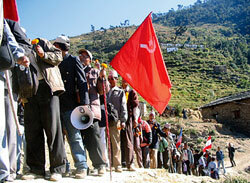 At the village level, the parties continue to mobilise support, as in this rally in Kalikot (right). The two most important issues ahead are: how King Gyanendra will react to this rebel-party combine as he returns to the country on Friday after his African air safari and whether the rebel leadership can take their cadre and fighters along on the road to peace. Besides the king, the parties and the rebels, the other players who will play a defining role in the weeks ahead include the Royal Nepali Army and the international community, including the United Nations, India, the western embassies, the judiciary and civil society. The peace train has started its journey in Nepal with the 12-point pact between the political parties and the rebels announced on 17 November. The understanding resulted in part from the decision taken by the CPN (Maoist) plenum a couple of weeks earlier in the Rolpa highlands. There is danger, however, that the train will be derailed by the cumulative reaction of the royal right-wing, an angry army unwilling to concede political resolution and western ambassadors remote from the hurly-burly of the Nepali political process and disrespectful of it. This transition to peace is credible because, this time, the Maoists have been forced to seek a surakshit abataran (safe landing) due to the people’s will, national circumstance and regional geopolitics. Seeing the impossibility of taking over the state by force of arms and to cash in what political credibility they have left, the rebel leadership has agreed to join competitive, open multiparty democracy. This decision registers a 180-degree turnaround at the policy level. Conveyed to the political party leadership in face-to-face meetings in New Delhi, it is a dramatic reversal, to be welcomed with all the required caution but without scepticism. 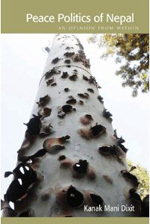 The decision by the Rolpa plenum renders the gun in the hand of the rebel fighter suddenly irrelevant, an anachronism. At the policy level there is no more a ‘people’s war’ being fought and the political parties and civil society must now assist the insurgent leadership to bring the followers along. The commisars are asked to conduct ‘political re-education’ of the very fighters they propagandised over the years-young men and women who they introduced to the gun-and persuade them to set aside the three-knot-three and socket bomb. The diplomats and pro-palace folks who point to the fuzzy areas in the 12-point document fail to realise that they have been left there to allow the Maoists leaders the space needed to convince their cadre. Any attempt to take advantage of these areas of deliberate opaqueness in order to destroy the rebel-parties understanding will affect the fragile moment. The fighting that would follow as a result would most likely finish off the rebels but will leave a charred landscape full of suffering-and a royal dictatorship in Kathmandu. The peace that the people crave will not arrive like night after day but the process has begun and will likely snowball. It is time to start planning national rehabilitation, to restore the torn psyche, support the tens of thousands of victims and the displaced and replace the destroyed health posts, repeater towers, bridges and police stations. The Maoist fighters themselves need to be rehabilitated even while we guard against spontaneous vigilante action against the rebels and their sympathisers. The all-important foreign policy establishment in the Indian capital is still in favour of the Nepali people’s democratic aspirations and will countenance the political parties as the lead players in the peace dialogue. It is important that the royalists in India, the Indian intelligence agencies, as well as the men in Indian khaki, not be allowed to seek a resolution that leaves the initiative with King Gyanendra. UN Secretary-General Kofi Annan has been soberly respectful of the people’s aspirations, as have Senator Patrick Leahy and a host of other Democrat and Republican lawmakers of the US Congress. The State Department, too, is on board and the British government has welcomed the 12-point pact. But there are western ambassadors in Kathmandu-the German plenipotentiary a case in point-who do not necessarily reflect the views of the home office but who like to exhibit full-frontal disrespect to Nepal’s politicians. This attitude finds play in the dreadfully contemptible suggestions of some diplomats that the proposed municipal elections are welcome. 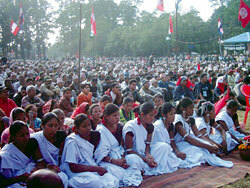 A dozen years of democracy has taught the Nepali people to distinguish between a free and fair election and a farce. After some time in the political wilderness, the 12-point understanding has once again returned the politicians to the driver’s seat of national affairs. The self-aggrandising mediators of the past, the heavily-funded Nepali and expatriate conflict resolution consultants and the competing international think tanks that presumed to guide Nepalis out of the morass-all have been superseded by the political parties in the peoples’ hour of desperation. The names of those who met Pushpa Kamal Dahal in Delhi on 17 November says it all and they deserve respect-Girija Prasad Koirala, Madhav Kumar Nepal, KP Sharma Oli, Krishna Sitaula, Amik Sherchan, Narayan Kaji Shrestha and Hridayesh Tripathi. In the past, the political parties could not generate crowds against the king in the name of democracy because the people first wanted peace. Today, they know King Gyanendra is not inclined to grant either, while the political parties are poised to provide both peace and democracy. That is why the rallies in Kalikot, Bharatpur, Butwal, Pokhara and Janakpur have brought in the crowds and why we are in the middle of an accelerating movement. Even as we look ahead to the return of peace and democracy, the royal regime has created conditions that will create endless hurdles on that path. The politicisation of the Royal Nepali Army and the rapid rise of a kickback merchant class are matters of particular concern, for the taste of power and the volume of money involved are enough to destabilise the democracy far into the future. February One diverted the RNA from its proud professional vocation and made it a partner in a coup d’etat. For nearly a year now, the army officer corps all over the country has been exercising absolute power and getting used to it. Many in the topmost echelon are also getting to like the taste of large commissions. Meanwhile, the operating national superstructure is being run to the ground, with the civil service and the police force dispirited and robbed of initiative. The other pollution underway is the attempt by the royal regime, which includes the mercantilist royal son-in-law, to make a fast buck through moneymaking public institutions. The salivating powerbrokers that have crept out of the Narayanhiti woodwork are today in the process of finishing off the National Telecommunication Authority and have their eyes on the airline industry, the substantial holdings of the Employees’ Provident Fund, the National Oil Corporation and above all, the hydropower sector-soon after 1 February, approaches were made to the National Hydro Power Corporation of India to sell off rights to significant national rivers. King Gyanendra has repeatedly shown his disregard for the public’s sensibility, the last being the surreal trip across the African continent. He has also been shown up on his inability to lead, to administer or to manage the economy and development. But while the king has been isolated in every way possible nationally and internationally, he has not been challenged politically on home ground. While he has been away on his air safari however, the ground has shifted back home with the 12-point understanding. We can expect an acceleration of the political movement against the 1 February coup and the king may finally have to confront a genuine political challenge fuelled by the populace across the land that wants peace with democracy. How he will responds, we will know soon enough. After he deplanes. Copyright © 2019 Kanak Mani Dixit. Powered by WordPress and Blog Start.